Product prices and availability are accurate as of 2019-04-02 15:48:56 EDT and are subject to change. Any price and availability information displayed on http://www.amazon.com/ at the time of purchase will apply to the purchase of this product. This 25 foot flat silver satin telephone cable is designed for data use, straight / 1 to 1 pin out. 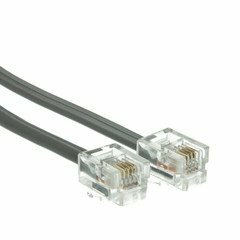 It is ideal for connecting modems and fax machines where the device is across a room from the wall jack. These telephone cords feature 6 position 4 conductor RJ11 connectors and four 28 AWG (American Wire Gauge) wires in each cord.